Because you are your best product. This is a guest post by Joshua Waldman. If you’d also like to guest post here on JobMob, follow these guest post guidelines. Warning: what I’m about to share with you might actually get you hired faster than you intended. Only follow these instructions if you want a job at your dream company within a few months and you are willing to do whatever it takes to get it. These two techniques are based on a single human characteristic, ego. Almost everyone Googles themselves. Even Lady Gaga googles herself, as if there were any risk of her not showing up! Most busy executives take the time to Google themselves too. And if they don’t, then their admins or customers do. Oh, and guess what the cheapest ads are to buy on Google and Facebook? That’s right, someone’s name. Are you catching on yet? Let me break this down step by step. For this ninja technique to work, you should first know who your top 10 dream companies are, and the names of the executives (or managers) who might have some say in hiring you. This is the easy part because LinkedIn will most likely have that information for you. Start by browsing the various industries on LinkedIn. Follow this link to a page that has been hidden by LinkedIn: LinkedIn Browse Industries, and select your preferred industry. Next filter you list of companies down by the characteristics you prefer such as company size or location. Finally, search within these companies for contacts with roles you suspect would be in a position to hire you. For example, if you want a marketing job, find the VP of marketing. If you want a developers job, find the director of product development. The way click ads work is this: someone Googles a search term, like their name. Since you’ve put a bid on that term, your ad shows up. If the ad get’s their attention, someone will click. You pay when they click. And that person is taken to a website. If you don’t have a website, then you need to get one NOW. All you need to do is buy a domain name ($10/yr). Then either set up a blog, or redirect it to your online portfolio, like Vizify. The idea is that when your target person clicks, they see information that is relevant to them and they perceive that you can provide value to their organization. This next story will illustrate why your web presence is so important. This technique came from Alec Brownstein, who is now sitting in a corner office at the top floor of his dream job (metaphorically of course). His story starts with a Google Ad Word campaign. Alec knew we wanted to work at Young & Rubicam (Y&R) New York. So he researched the names five creative directors, whom he admired the most. After two months, Alex received calls from four of his five target people. A few months after that, he had job offers from two of his target creative directors. This next technique comes from Ian Greenleigh who found that most managers and leaders are so proud of their success, that they usually fill in their entire Facebook profile, including their role at their company. This revelation helped him get hired at his dream company, Bazaar Voice, in a few short weeks. 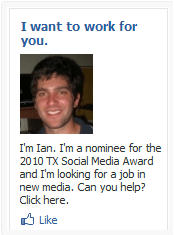 Ian took out an ad in Facebook Ad Manager platform and directed it just to people in a specific geography, who had a specific role in their bio. Take a look at his ad here on the right. And it directed people to a page on his website called, “5 Reasons You Should Hire Me”. If you want Joshua Waldman to win, share this article with your friends. If you liked this article, you'll also enjoy The Secret To Finding Dream Jobs. Subscribe to JobMob via RSS or email and follow me on Twitter for more tips on finding the job of your dreams. great article per usual Josh. I am a big advocate of approach # 1 and blogged about it recently….for what it is worth, here was our advice…. These two examples serve as powerful “thinking outside of the box” techniques for job-seekers. Great idea to use Facebook; it makes perfect sense to leverage the world’s largest social media network for more than just uploading photos. I just purchased my domain and I am planning to link it to my portfolio using Vizify. Thanks Joshua! This technique sounds really promising and I’m hoping to put it into effect PDQ. Thanks! article on my Facebook Business Page. Now this is a great approach to getting yourself seen, and I like it. With vanity the way it is you bound to have people find their way to you once you do this. I like the idea of going away from conventional job hunting techniques in favor of a creative almost guaranteed way to make yourself seen. Great article. I’m going to take all this advice on board.